I would love to participate in your scrap giveaway! I love to see what fabrics other quilters are using and there is nothing happier than a scrappy quilt! Thank you for the chance to win. I have a few scrap quilts in my not too distant future. your scraps are prettier than mine tho! Oh my gosh I WOULD LOVE TO WIN. at UBC. I also have a niece teaching in Japan. This is such a coincidence. 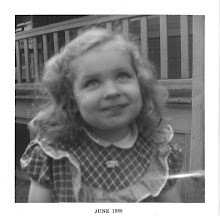 I JUST SPOKE TO MY COUSIN THAT I HAVE NOT SEEN FOR 50 YEARS. AND NOW THIS GIVEAWAY. Oh, I'd love to win your scraps! Happy New Year. Your scraps are even lovely......would be fun to play. My favorite quilts are scrappy ones. Your scraps would add a different colorway to my stash. Thanks for this contest. I would love to win your bag of scraps and book. The scraps would add needed variety to my scrap quilt. I am just finishing my first scrap quilt using a pineapple block and it turned out great. Thanks for the giveaway and the pattern for the picinic quilt. I have to agree with Pixie - that your scraps are prettier than mine. I would certainly love to play with them if I win. Oh, I'm so excited. I love your quilt. I just blogged about the Scrap Sew Along and wondered who the first guest would be. This is going to be so much fun. 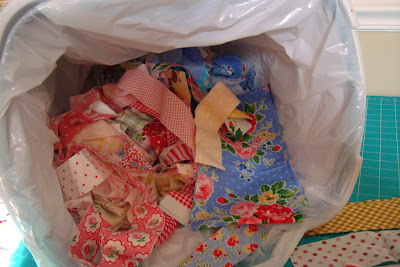 Hello, I'm scrapaholic: I can't throw away any little fizzle fabric.... And I would like to be a winner of your scraps!! I love scraps! Other peoples are the best! Thanks for a great giveaway! I'd love to win your scraps. In the past couple years I've been using more of the brights like your scraps and would love to add your pieces to my collection. Thanks for the chance to win. Your scraps are such happy fabrics! I would love to use them in a quilt. Oh they are so pretty. I love scrappy quilts, they remind me of my grandmothers. I made several scrappys in 2011. I lived in Japan in the mid-60's, I graduated high school there. I was just a kid so didn't really collect anything ... oh to know what I know now. Thanks for the offer. Such pretty scraps! Thank you for including me in your giveaway. Happy New Year! So fun to see you and Jodi working together! You know you have wonderful scraps and I wouldn't mind using some in a spiderweb quilt I am plugging away on whenever I have scraps. Thank you for the chance and thank you for that great picnic quilt tutorial--it is lovely. Been looking forward to this quilt along with scraps and would love to use some of yours. Thanks! I would love to win. Scrappy quilts are the best. I always like to see what other people are using as I end up with same colors. Need newness in my quilts. Not sure I. need someone else's scraps, but love the idea of busting my own. Thanks for the ideas. What a BEAUTIFUL bag of scraps! Thanks for the chance to win. What a lovely Scraps Sew Along! And what a wonderful giveaway! Now that would make a wonderful win for the New Year. i'll bet your scraps are prettier than mine. i love this quilt. and have been cutting my scraps into sizes hoping that i will some day make it. happy scrappy new year!! Oh my gosh, I'm having chest pains at the thought of your scraps. Doesn't everyone get heart palpitations at the sight of beloved fabrics? Don't put me on the list, but omg those scraps look delicious! And I happen to know that book is really good too! I would love, love, love to participate in your scrap give-away. I thoroughly enjoy scrap quilting and you have lovely scrap fabrics. Your scraps are gorgeous and I was just googling Japanese craft books yesterday - so this is timely!!! What a great colorful way to start the new year! I love your choices of fabrics in your quilts. What fun it'd be to win your scraps! You have the prettiest scraps I have ever seen...that quilt so so wonderful. I will opt on on the chance to win them, since my closet is overflowing with my own scraps...although not as pretty as yours! Being a scrap quilter - anyone's tidbits find a use here. I have 3 projects on the wall right now for the new year - all from scraps. Yours would meld nicely with the bag of 30's waiting for spring inspiration. Love the tutorial. I saved it when you posted it last year though I haven't made one yet. Thanks for the chance to win. Oh gosh, I'd love to get some of those pretty scraps. Not only for a quilt but, scraps make great little pieces to add to baby things and those pretty scraps have potential for our Granddaughter being born next month. All those pinks and flowers are perfect. Nanette, your scraps look more interesting than some of my finished projects! And you know I love your picnic quilt. Great post. Happy New Year! I love your picnic quilt! Please enter me in your giveaway to receive your scrap bag and book. Thanks! I printed out this tutorial when it first appeared. Still have not made it - LOL! Thanks for the chance to win your lovely scraps and happy 2012. I just started a scrap quilt yesterday -- I would love more to work with! Love your scrapquilt! Thanks for giving away some scraps! scraps AND the book!!! Oh, please,M-E!!!! Jodi sent us over and I am so glad she did! I love the scrappy quilt you made. the directions are very clear even o a novice like me. Thanks for the chance to win too. I just love this quilt!! I'm trying to finish one of my scrap projects right now!! I have your tutorial bookmarked for one of my next scrap projects!!! Love it!! I would love to win your scraps!!! Love your quilt and tutorial, Nanette. Thanks for the chance to win your lovely scraps. Happy New Year! Who couldn't use a few more scraps?!! Plus a book - Hooray! I've been collecting scraps for the picnic quilt and would love to win yours! Happy New Year....I enjoy your blog. Thanks Nanette for sharing your goodies with us! I love adding scraps from other quilters to my projects. I've not looked at any of the Japanese craft books. That would be a treat, too. Take care! What a great tutorial! It is a happy and cheerful picnic quilt. I'd love to be entered in to win some of your fabric scraps. I don't have many scraps of my own so other people's fabric is pretty exciting! As a beginning, self taught (internet) quilter, this project is right up my alley. And I'd love the opportunity to win your scrap bag and book. Thanks! I'd love to win your scraps and book! Those scraps, btw, are way prettier than what's in my scrap stash! I've also pinned your picnic quilt--I love it! So simple, yet so gorgeous! I want one! No need to include me in the giveaway -- I just wanted to tell you how gorgeous your scrappy quilt is. And my scraps are jealous of your scraps. :-) Thanks so much for the tutorial. Love the Picnic Quilt and the easy instructions. I would love to make it once I get some scraps saved up! Thanks for the chance to win! I love scraps. I think scrap quilts are so beautiful and would love to add more scraps to mine. I can't wait to start a quilt from your tutorial. Thanks so much. 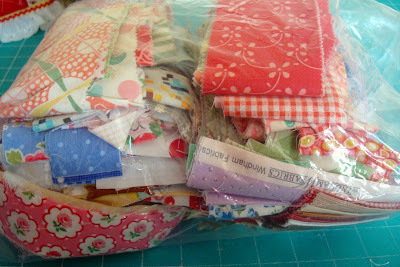 Would love to win the bag of scraps and the book too :) One can never have too many scraps! I think it would be so much fun to win someone's scraps! Thanks for the chance! That book looks amazing too. I just love scraps! I bought a huge bag of scrappy squares at an antique mall last year and have been wondering what to do with them. Now I know. I'll make a picnic quilt! I always love the fabrics you buy and having your scraps would be wonderful. I just added this little darling to my "must do" for this year! It makes me happy! I LOVE your picnic quilt! I will definitely have to make one! It makes me smile just looking at it. I am just getting back into quilting and am loving the look of scrappy quilts. However, I don't have many scraps...so this giveaway is perfect! Thanks for the inspiration and the opportunity to win some happy scraps! I love scraps. I am known in my small quilt group as the scrap queen. I would love to add these scraps to my stash. Thanks for the great giveaway. Your scraps are precious! And that picnic quilt is adorable. love scrappy quilts best of all. I love your Picnic quilt Tutorial! I have been collecting scraps for it. I would love to win some of your pretty scraps to add to my quilt! Thanks for the chance!!! such a beautiful quilt idea! I've been trying to figure out what to do with my scraps! I'd love to be entered for a chance to win your pretty scraps! Thanks for the tutorial. I'd love to participate in the scrapping that Jodi is doing! 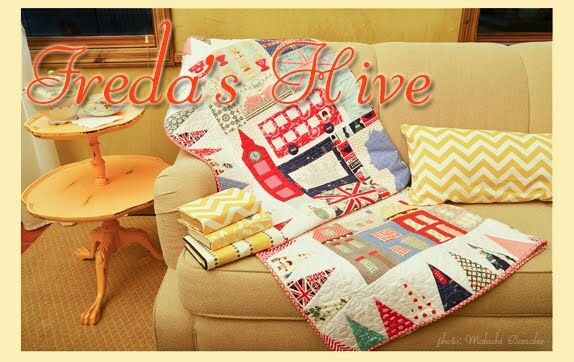 Love the tutorial over at Jodi's Nanette! And those scraps look too good to not give a try at winning! I love this Picnic quilt and I also love your scrap bag giveaway! I have been looking at the great Pam Kitty Morning fabrics for awhile, so I was excited to see some of those in your bag. 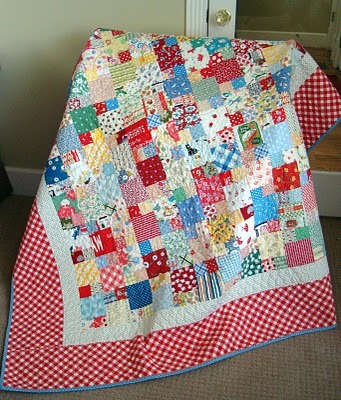 I love this picnic quilt and have quite stash of scraps (I can't bear to throw it away). I would love to win your giveaway. oh I would love to win the book and the Scrapbag. There can never be too many patchworkbooks for me. And since I don't have that many scraps myself yet I would love to receive yours and make a + Quilt out of them. Have just found your lovely blog. Why are other peoples scraps much more interesting than ones own??? I would so love to win these scraps and the book , I would also be willing to swap my scraps as well, that would be interesting to swap I think. Using anothers offcuts!!! Don;t know what you could end up with a very happy shared quilt I would think. Someone elses scraps ! Sounds like fun...mixing mine with yours for a quilt ! Pick ME !!!! I would love to win! As a new quilter I haven't built up a fabric stash or scrap stash, winning this would help me complete a scrap quilt with a lot more variety than I have. Thanks for the chance! I love scrappy sewing! I love how fabrics take on a whole new "personality" when paired up with random patterns. My scrap stash is quite small, so I would LOVE to add your bundle of scrappy treasure to it so I can join in! I just stared quilting and I would LOVE these!!!! Count me in! wonderful! thanks so much for sharing your time and talent.Love your blog. Thankyou again! What a gareat way to make a scrap quilt. I would love to participate in your giveaway, I love scraps! Im working on using my scraps this year and limit my fabric purchases. Id love to participate. THanks for hosting the giveaway. Wonderful scraps, great book! Thanks for the chance to win these! I found your blog from PH and found that one through craft gossip i think. Anyway, I LOVE scraps. I actually just started sewing as a hobby about 3 months ago and my first peices of fabric where thrifted sheets and table cloths, but after that i found 3 bags of scraps at the thrift store that had to be about 5 or 6 pounds each for 2 bucks. Anyway, my family sorta thinks i'm nuts for thinking thats awesome, but Im STILL excited about that find and now i'm always on the look out. I dont know why i posted my life story but, i just wanted you to know that giveaways like this are my favorite. I'm going to follow your blog! Hi Nanette- Your scraps look scrumptious. I'd love to win the scraps and the book - such fun. I love your quilt and have bookmarked it! I'm new to quilting so don't have loads of scraps yet but I'm sure I will! I would love to get some of yours to add to mine! Great tutorial--thanks for sharing! Would love to win some of your scraps so I can make a scrappy quilt--I'm a new quilter and haven't generated many scraps yet. Thanks for the chance! I love scraps & scraps quilts, thanks for the tuto and giveaway. Your scraps are better than mine! I'd love to have them! Thanks so much for the opportunity. Happy New Year! What fun this is - would love your "scraps" - oh the possibilities. Thanks for the chance to win. Your scrap collection looks amazing! I took an unwelcome break from quilting for a few years due to work and family responsibilities so I desperately need scraps to jump start my stash! Thanks for the chance to win! I love scrappy quilts. I would love to win some of your scraps. Your picnic quilt is a fun use of scraps. Thanks for the opportunity to win. Scraps! What fun! I love your picnic quilt. I have to make one. Thanks for your giveaway. My dear mother-in-law made my girls quilts when they were very young. I have a new Grand daughter and would love to carry on the tradition. More scraps is just what I need. Thanks for the chance to win. I am so impressed with your "controlled" postage stamp quilt. I can't wait to dig through my scraps. I think it's the two sizes that makes it work so well. I love your picnic quilt and look forward to diving into your site. I look forward to more scrappy ideas. Thanks for sharing your "scraps" with us. Of course you know that I love this Nanette! Remember when I started my own way back then?.... Then I got side tracked and it's still not done! this sounds like a lot of fun. for some reason I did not get Jodi's blog post in my email but went to check it out. I will be doing a post to include her sew along. Off to refresh my memory about your tutorial. Thanks for a chance to win some of your great scraps. This is an amazing giveaway... count me in!!! I love a scrap quilt but have only made table runners and I do enjoy reflecting what each scrap was used for!! Thanks for the chance!! Thank you for the scrap giveaway. I am pretty new to quilting so I dont have that mucha and this would be a nice addition - I could make a picnic quilt! thanks again and happy new year! Love your scrappy quilt. Makes me think back to one that my mom would put on my sister and my bed. Now I am wondering what ever happened to it. I would love to win your bag of scraps and make one of my own. Thanks for the opportunity at the give-away. 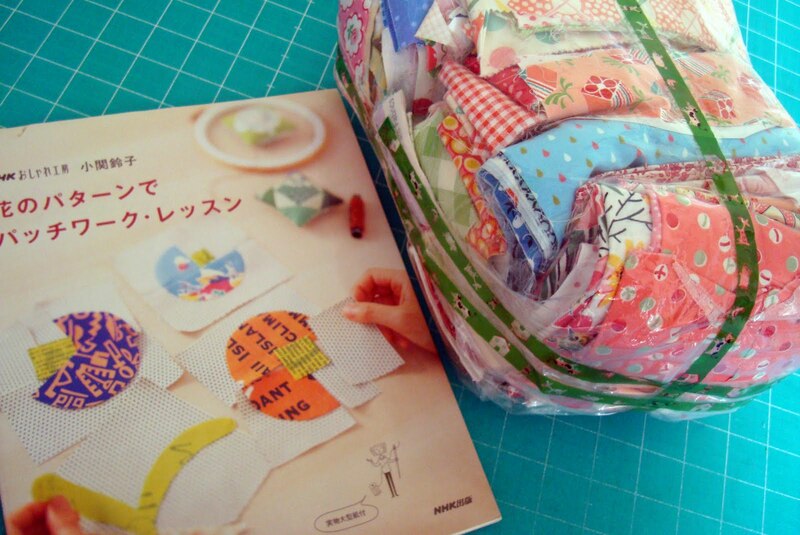 Scraps and a Japanese Quilt Book would be the perfect way to start off the New Year! :) Here's hoping that I win! I love this scrap along, sad part I'm relatively new to quilting and don't have a lot of scraps yet. Soon though, thanks for an adorable tutorial. What a fun giveaway! Was reading over at Pleasant Home and really like your tutorial. I am attempting my first picnic quilt this year from denim scars and regular scraps. And I too hope ts ready for summer! I think a scrap quilt project is a great way to start the year off. I am glad to see Jodi doing this. Your quilt seems so easy and looks so wonderful. Love the looks of your quilt. Great way to start the new year! With a Scrappy Attitude!! I'd love the chance to win! Thanks! What a fabulous way to start the new year. I'd love to win your scraps! Count me in, for sure. I love scrap quilts and I know what a wonderful way it is to use up those leftovers. I participated in Jodi's scrap-a-long last time and used up all my 30s scraps. And what a lovely quilt it made. Winning your scraps would really get me going. Thanks for being so generous. Ohhhh count me in! I LOVE scraps and often buy scrap bags. It's so fun looking through each piece. It's like Christmas all over again. TY! Scraps--just made my first string blocks. I don't have too many scraps yet and would love yours! What a fun bunch of scraps!!! I would love to win!! Thanks for the chance!! I also Love the quilt you you made with your scraps so cute!!! Love that scrap quilt. Scrap quilts are my favorite. In spite of making several scrap quilts I can't make a dent in my pile of scraps. Awesome fun way to get scraps! Thanks for the chance to win! I would love to win your scraps. I only started quilting this fall, and am trying to accumulate enough scraps to make a pretty patchwork quilt. Great tutorial, and thank you for the giveaway. I am new to quilting but don't have scraps yet : ( I love reading your blog and can't wait till I have enough scraps to start my own project! We recently moved across the country, and there was no room for my stash. Winning this giveaway would put such a huge smile on my face! I'm definitely a scrap lover! Looks like you have lovely scraps! I would love to win them! I haven't quilted enough to obtain such lovely scraps as yours and have wanted to do a scrap quilt for some time. Thank you for the chance. Your bright and cheery scraps would play so nicely with my meager scrap collection! Thanks for the chance to win! The scraps look good I'd make a ticker tape quilt with them. SOOO fun! That book looks like it's a fun read! Thanks for the opportunity! Great quilt! Thanks for the tutorial. Love your scrap quilt...thanks for sharing....love to win some scraps...it would be very inspiring! I love scraps - count me in please! Love the tutorial, love the scraps.I really love other peoples scraps. Hurray - 2 new quilting sites! I would love your scraps. I have some of my own ;)and now with a site devoted to scrap quilts I can get busy. 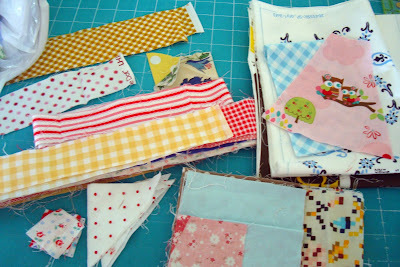 I love that picnic quilt and would love to make one but I don't think I have enough scraps yet. These would be perfect to mix with what I have. I'm new here and have bookmarked your site because I'll be back often. This is all so inspiring!! I like your scrappy quilt. I am going to do a baby quilt with this for a friend. Wish me luck! I would love some scraps! I am new to quilting, and actually don't have many scraps (yet). I hope to remedy that this year! Thanks for the chance to win! What great idea for a quilt along! I'd love some scraps and I'm going to give the picnic quilt a go, thanks! This sounds like so much fun. I'd like to join because I've been trying to think of an easy quilt to start the new year. Those look like great scraps! Love the quilt, great tutorial! I just ordered an accuquilt and I think the starter set comes with a 4.5 and 2.5 die so this may be its first project! wow! how exciting! i would love to win that book and all of your scraps. your fabrics are the best. please count me in. thank you very much for this opportunity! Such pretty scraps! Thanks for the chance! I can't bear to throw out any scraps that may be used for craft projects or quilts. I love scrap quilts. Thanks for the giveaway. I'd love to have that book too. I bet you have great scraps! Thanks for the chance. I would love to win your scrap bag. Your picnic quilt is on my to do list. Thanks for the giveaway. I love scraps :) What a beautiful picnic quilt. Thanks for the fun scrap giveaway. Your scraps are very beautiful and I would be so pleased to be the lucky winner! Thanks for the giveaway. Lovely quilts mean lovely scraps, which means lovely scrappy quilts! I love this quilt, I want to make one now. What a great way to use up a lot of scraps. Thank you for sharing. 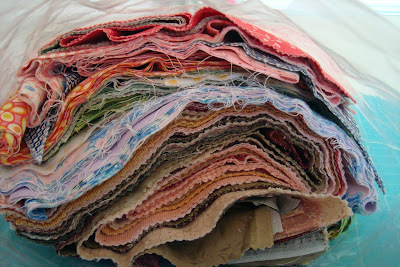 i'm collecting a rainbow of scraps right now - looks like you've got lots of fun colors in that bag!! Hi Nanette, Happy New Year! I am trying to do some cleaning at my house, too, but I would also love to win your scraps! It's always fun to play with others' leftovers! :) I have had your quilt on my to-do list for a while now, too. Thanks for sharing. My scrap bins are so full, I can't believe I would enter a giveaway for yet MORE scraps. But how could a couple more hurt? I would love to win the giveaway! Thanks for the chance. And thanks for the inspiration you offer. The scraps are so beautiful!! I hope I win them...thank you for this opportunity. Nanette it would be so fun to win all your wonderful scraps. I love all the fabrics you use, but I don't usually buy these types of retro fabrics, so I would be so pleased to win. Thanks for the chance. I would love to participate in your scrap bag give-away please. Your picnic quilt is lovely and your scraps are lovely too. Much prettier than mine. Oh and the book too! I would so dearly love to win please. Happy new Year! I love to make scrap fabric quilts. Would love to win your Awesome giveaway. WOW, that is one great looking bag of scraps. Totally different from the scraps I have. Would be wonderful to win. I've already started using your Picnic tutorial as a leader/ender project. Thanks for the great idea! Nanette... you are always up to something fun! My... to be a winner of your scrap bag would be better than a bar of chocolate would be to a chocoholic. Your fabric is the cutest stuff ever! I love your tutorial on the picnic quilt. I will love making that! Thanks for all you do!!! I would love to praticipate in your beautiful giveaway, and thank you so much for the chance to win. I love anything scrappy and this seems like an easy project to use up scraps. I plan to work on this quilt this coming weekend. Thanks for the great tutorial!! WHAT an AWESOME giveaway!! The Japanese craft book looks fantastic, Nanette. What a great giveaway Nanette! I have enough scraps to choke a horse, so please don't include me -- I just wanted to hop on and say again how much I love that quilt!!! Utilitarian that I am, I love scrappy quilts. This would be THE year to tame my scraps and I think I'll play along....I've always envisioned a scrappy triple Irish chain as my first project. Would love to add your clear bright colors to my more subdued scraps. I'm definitely interested in your lovely scraps! My scraps are starting to seem old to me. I've only been quilting for 5 years, but do I have scraps!! I'm not very organized though, so you and Jodi have inspired me to give it a go. Thanks for the chance to win!! And Happy New Year! Yes, who wouldn't want to have those beautiful scraps.......please let it be me. I am hooked on scrap quilts. I always love your color combinations.......just my style! Thanks for sharing....that's what it is all about.